“The Kiss” is an 1859 painting by Italian artist Francesco Hayez. Description: The painting represents a couple from the Middle Ages, embracing while they kiss each other. It is among the most passionate and intense representations of a kiss in the history of western art. The girl leans backwards, while the man bends his left leg so as to support her, simultaneously placing a foot on the step next to him as though poised to go at any moment. 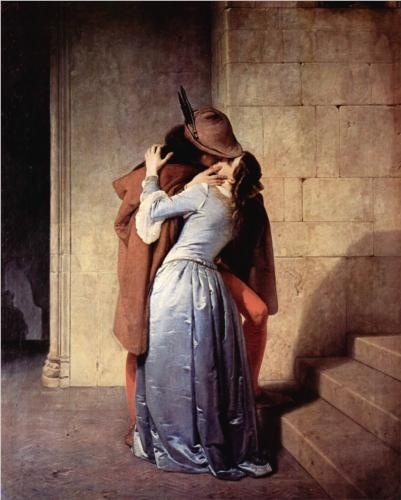 The couple, though at the center of the painting, are not recognizable, as Hayez wanted the action of the kissing to be at the center of the composition. It was inspired in part by the exploits of the Black Brunswickers, a volunteer corps of the Napoleonic Wars, during the Waterloo campaign and in part by the contrasts of black broadcloth and pearl-white satin in a moment of tender conflict. The painting depicts a Brunswicker about to depart for battle. His sweetheart, wearing a ballgown, restrains him, trying to push the door closed, while he pulls it open. This suggests that the scene is inspired by the Duchess of Richmond’s ball on 15 June 1815, from which the officers departed to join troops at the Battle of Quatre Bras. “Flirtation” by Frédéric Soulacroix (1858–1933). Date of painting unknown. Son of famed painter and sculptor Charles Soulacroix. By the age of 15 years, in 1873, Frédéric entered the Accademia di Belle Arti of Florence, and, in October 1876, he was admitted to its School of Painting. He remained in Florence for many years painting often romantic genre pieces in costume of the 18th or early centuries. “Amorous Advance” by Italian painter Arturo Ricci (1854-1919). Ricci introduces the fashionable woman where élégantes gather in the company of a suitor. Ricci studied at the Accademia di Belle Arti di Firenze. His figure scenes often center around ceremonial occasions such as weddings or banquets. He captures the exchanges of glances and gestures which so eloquently evoke the intimacies of domestic life. The act of reading a poem or a letter was a favoured subject. Such works invite the viewer to speculate the meaning by decoding clues such as the look of the ladies or their positions. ← Bad Valentines ~ OMG! I love viewing all the paintings. I even recognised ‘Flirtation’ as one of the covers used in a Georgette Heyer novel published by Sourcebooks. Thanks for posting this, Sharon. Beautiful paintings. I love The Kiss! I adore the “The Kiss” perhaps an inspiration for a future novel Sharon!!! They are all so beautiful! My favourite is The Black Brunswicker. I love the play of emotions in the painting. Thank you for sharing them with us. Thank uoi for sharing the paintings. The first painting entitled “The Kiss”, I think is the most beautiful of the five due to the emotions it creates in the observer, like we’re looking in on a private moment….